The China International Transplantation Network Assistance Center (CITNAC), which focused mainly on foreign patients, was founded in 2003 under the organ transplantation department of the First Affiliated Hospital of China Medical University. We refer to it by the name on its English website.6 While nominally foreign-owned, the center was established within a Chinese hospital. The government apparently used this structure, and the prosecution of a foreign national, to avoid culpability for illicit organ transplants carried out by a Chinese institution. "Japanese national suspected of illegal operations in China, arrested according to law by Shenyang prosecution office. Sohu News. October 16, 2007." "Price list (archived web page). CITNAC. August 29, 2007." "Online Answers (archived web page). China International Transplantation Network Assistance Center (CITNAC) September 5, 2004." 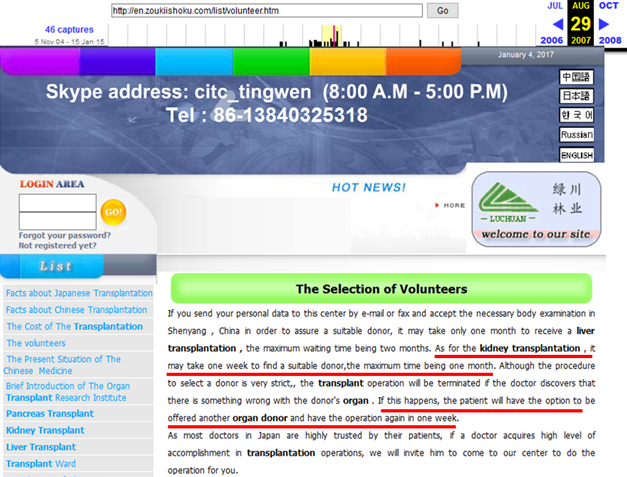 "Facts of Chinese Transplantation (archived web page). China International Organ Transplant Center. October 23, 2004." "Introduction of China International Transplantation Network Assistance Center. October 22, 2004."